The proportion of all legal foreign-born residents who have become naturalized U.S. citizens rose to 52% in 2005, the highest level in a quarter of a century and a 15 percentage point increase since 1990, according to an analysis by the Pew Hispanic Center. The population of naturalized citizens reached 12.8 million in 2005, a historic high that reflects both a rise in the number of legal migrants and an increased likelihood that those who are eligible apply for citizenship. As a result of these combined trends, the average number of naturalizations annually has increased from fewer than 150,000 in the 1970s to more than 650,000 since the mid-1990s. By 2005 (the last year for which figures are available), naturalized citizens accounted for slightly more than one-in-two (52%) legal foreign-born residents. 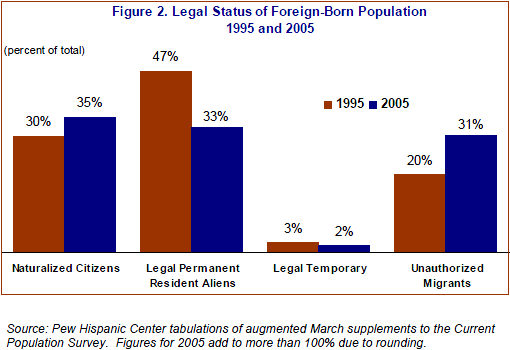 Among all 36 million foreign-born residents in 2005, naturalized citizens made up a slim plurality (35%) over legal non-citizens (33%) and unauthorized migrants (31%). In 1995, legal non-citizens had accounted for a near majority (47%) of the 24 million foreign-born residents who were in the country at the time, compared with 30% who were naturalized citizens and 20% who were unauthorized migrants. The population of immigrants who are eligible for naturalization was 8.5 million in 2005; of these more than a third, or nearly 3 million, were Mexican. Mexicans still have a comparatively lower tendency to become U.S. citizens, but the number of naturalized citizens from Mexico rose by 144% from 1995 to 2005—the sharpest increase among immigrants from any major sending country. While the number of legal permanent residents admitted to the U.S. has risen in recent years, the number of naturalized citizens has grown even more rapidly (Appendix Table 2). In fact, because so many new immigrants have become citizens, the size of the legal non-citizen population has barely grown since the mid-1990s. These trends point to a sharp rise since the mid-1990s—following nearly half a century of decline—in the tendency of legal permanent residents to naturalize. Legal immigrants are not only becoming citizens at a higher rate than in the recent past, but they are also naturalizing more quickly. Whatever the reasons for this, it is clear that today’s legal immigrants are signing on to a closer relationship with the U.S. than was the case a decade or two ago. The number of unauthorized migrants also rose sharply between 1995 and 2005, the main period covered by this analysis—so this 10-year stretch has seen a growth among both the most and the least rooted of immigrants. The makeup of the naturalized population has also changed. Immigrants from Europe and Canada no longer are the largest group. Over the past decade, they have become outnumbered by naturalized U.S. citizens from both Latin America and Asia.1 The number of new citizens from Latin America grew by nearly 2.4 million—more than that from any other region—between 1995 and 2005. Although immigrants from Europe are among the most likely to become citizens, naturalization rates are rising more rapidly among immigrants from other parts of the world. This analysis also finds, as previous studies have shown, that the longer immigrants have been in the U.S., the more likely it is that they will become citizens. Men and women are about equally likely to naturalize. Immigrants are most likely to naturalize if they speak English well, are highly educated or have high incomes. Also, people who are homeowners or are married to U.S. citizens are far more likely to be naturalized than those who rent or are married to noncitizens. This report is based largely on data from the U.S. Census Bureau’s Current Population Survey, with some adjustments (see Methodology section). It also draws on data from the federal Office of Immigration Statistics, now part of the Department of Homeland Security. The proportion of all legal foreign-born residents who are naturalized rose to 52% in 2005, the last year for which figures are available. The proportion hit a low point of 38% in 1990 and had begun to rise by 1995. 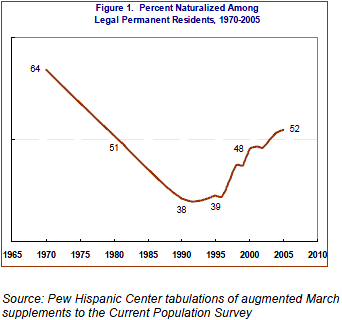 The proportion of legal immigrants who are naturalized is now about the same as it was in 1980, when the share had been declining since its peak of 79% in 1950. Not all legal immigrants are eligible to become U.S. citizens. Among those who are eligible, the naturalization rate increased to 59% in 2005. A decade earlier, it was 48%. The number of naturalized citizens from Mexico grew 144% from 1995 to 2005, a greater increase than that of any other major sending nation or region. Although immigrants from Mexico are less likely to become citizens than those from other countries, the gap closed somewhat between 1995 and 2005. 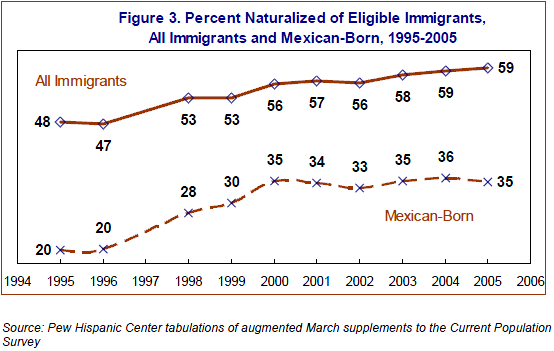 Only 20% of eligible permanent residents from Mexico had naturalized in 1995. In 2005, 35% had. Mexican-born legal immigrants constitute more than a third of the eligible population, or nearly 3 million out of 8.5 million. Although the nation’s population of legal permanent immigrants has grown significantly—by 30% from 1995 to 2005—the number of naturalized citizens climbed even more, by 73% during those years. The number of non-citizens who are legal permanent residents was 11.8 million in 2005, only a slight increase from 11.5 million in 1995. That is because the rising naturalization rate is offsetting growth in the authorized immigrant population. Immigrants eligible to naturalize numbered 8.5 million in 2005, a small rise from 8 million a decade earlier. Additionally, 2.8 million people soon will be eligible for citizenship but are too young or recently arrived to apply. Naturalized citizens are a slightly larger proportion of the foreign-born population (35%) than legal non-citizens (33%) and unauthorized migrants (31%). In 1995, those proportions were 30%, 47% and 20%. • There are nearly 4.4 million naturalized citizens from Latin America, 4 million from Asia, 2.8 million from Europe and Canada, and 444,000 from Africa and other regions. The naturalized citizen population from the Middle East is a relatively small 726,000. But its numbers grew 156% from 1995 to 2005. Middle Easterners were increasingly likely to naturalize after 2001. Among immigrants eligible to become citizens, 77% of those from the Middle East had done so by 2005, compared with 71% from Asia, 69% from Europe and Canada, and 46% from Latin America. The high citizenship rates of immigrants from some Latin American countries are offset by Mexico’s comparatively lower rate of 35%. Immigrants eligible and soon to be eligible for naturalization are less welleducated than the naturalized population. Among foreign-born citizens, only 15% of adults ages 25 to 64 did not graduate from high school, compared with 38% of those who are eligible and 27% of those soon to be eligible. Naturalized citizens are less likely to be poor than legal permanent residents who are eligible for citizenship, or will soon be eligible. About 14% are below the poverty line, compared with 24% of those eligible to naturalize and 30% of those soon to be eligible. One in four unauthorized migrants (25%) is poor. Naturalization rates are rising both among immigrants who arrived recently and among those who have been in the U.S. for decades. But an analysis of cohorts—groups of immigrants who arrived in the same year— shows that those who arrived in the 1990s have taken less time than those who arrived earlier to reach the same naturalization rate. The nation’s historic peak in new naturalizations was in 1996, when more than 1 million people became citizens. The number declined after that, then rose this decade to 600,000 to 700,000 annually. Because the number of legal permanent admissions exceeded 1 million for several years this decade, naturalizations also could rise somewhat. The federal agency that processes citizenship applications, the U.S. Citizenship and Immigration Services, recently proposed an increase in naturalization fees, citing rising costs. The cost of processing a citizenship request for adult applicants would rise from $330 to $595 and for children from $225 to $460. The following terms are used describe immigrants and their status in the U.S. In some cases, they differ from official government definitions because of limitations in the available survey data. Legal permanent resident, legal permanent resident alien, legal immigrant, authorized migrant: A citizen of another country who has been granted a visa that allows work and permanent residence in the U.S. For the analyses in this report, legal permanent residents include persons admitted as refugees or granted asylum. Naturalized citizen: Legal permanent resident who has fulfilled the length of stay and other requirements to become a U.S. citizen, and taken the oath of citizenship. Unauthorized migrant: Citizen of another country who lives in the U.S. without a currently valid visa. Eligible immigrant: In this report, a legal permanent resident aged 18 or older who meets the length of stay qualifications to file a petition to become a citizen but has not naturalized. Soon to be eligible immigrant: Legal permanent resident who will become an eligible immigrant (i.e., will meet the age and length of stay requirements to naturalize) in the next five years.